LOCATION.--Lat 44°35'58", long 75°22'44" referenced to North American Datum of 1983, St. Lawrence County, NY, Hydrologic Unit 04150302, on right bank 1.5 mi downstream from Beaver Creek, and 2.5 mi upstream from Heuvelton. PERIOD OF RECORD.--June 1916 to current year. GAGE.--Water-stage recorder and crest-stage gage. Datum of gage is 288.85 ft above NGVD of 1929. Prior to Sept. 16, 1916, nonrecording gage at same site and datum. REMARKS.--Entire flow regulated by Cranberry Lake (station 04260990); slight diurnal fluctuation at low flow and medium flow caused by powerplants. During high stages on Grass River, part of flow of that stream may pass through Upper Lake, Indian Creek, and Lower Lake and enter Oswegatchie River at Rensselaer Falls, 4.5 mi upstream from station. In October 1973, a dike was installed on Indian Creek to prevent overflow of Grass River during high flows. Water Years 2014-15: Records good except those for estimated daily discharges, which are poor. Water Year 2016: Records good. EXTREMES FOR PERIOD OF RECORD.--Maximum discharge, 19,600 ft³/s, Apr. 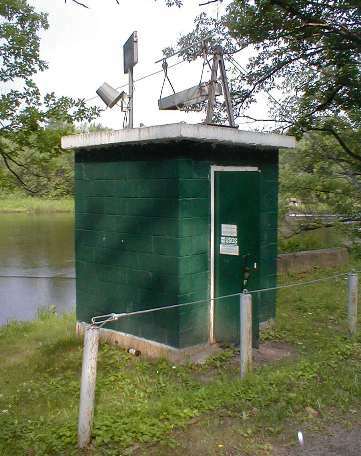 6, 1960, gage height, 10.36 ft; minimum discharge, 99 ft³/s, Aug. 4, 1991, gage height, 0.49 ft; minimum gage height, 0.42 ft, Sept. 11, 2002, but may have been lower during period of no gage-height record Sept. 7, 1960.